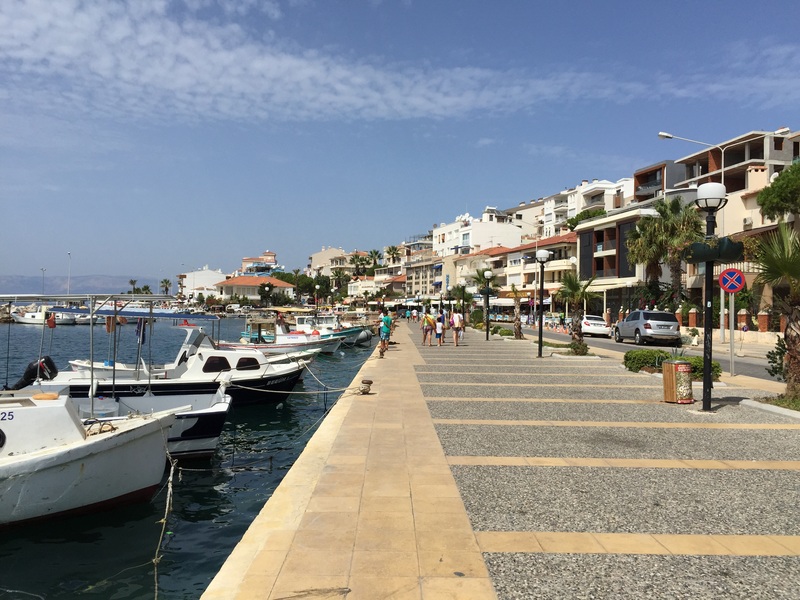 Over the next two days we travelled and visited the coastal port towns of Bodrum and Cesme. 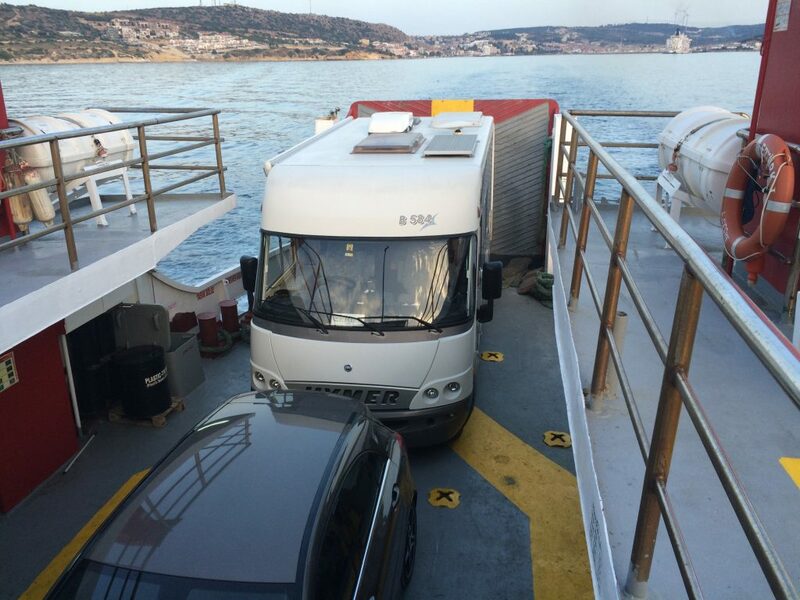 We were seeking to organise a ferry from Turkey to the Greek island of Kos from Bodrum, which we thought was set until we arrive at the port to find our Hymer was too tall or so we were told. So disappointed we drive on north for another 3 hours to Cesme. Soon enough we have our tickets to Chios and the Hymer is booked in as well. It’s an expensive passage at €220 for a one hour journey to Greece, but given we can catch a ferry to Athens overnight it saves 4 days driving and the diesel for the Hymer as well. The pressure is off, we have our tickets and head to the beach. 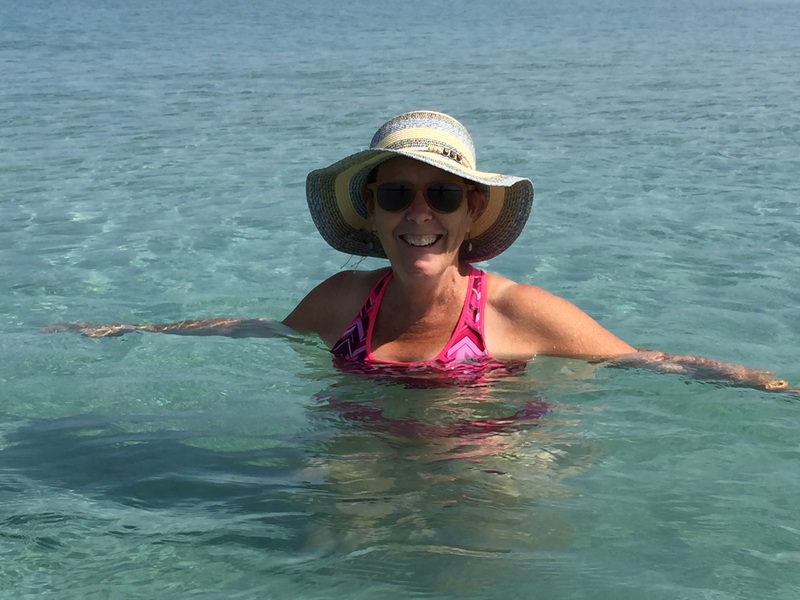 The sand is not Cronulla, but the water crystal clear and so refreshing. The waterfront in Cesme. We found it to be much more laid back than Bodrum which is more a resort town. Did I mention the Turkish are a patriotic bunch, this is the town square in Cesme. Although as you can tell it’s actually the town triangle. We have a lovely lunch of local sea bass on the waterfront. The Hymer gets it’s first bath after 4 weeks on the road. 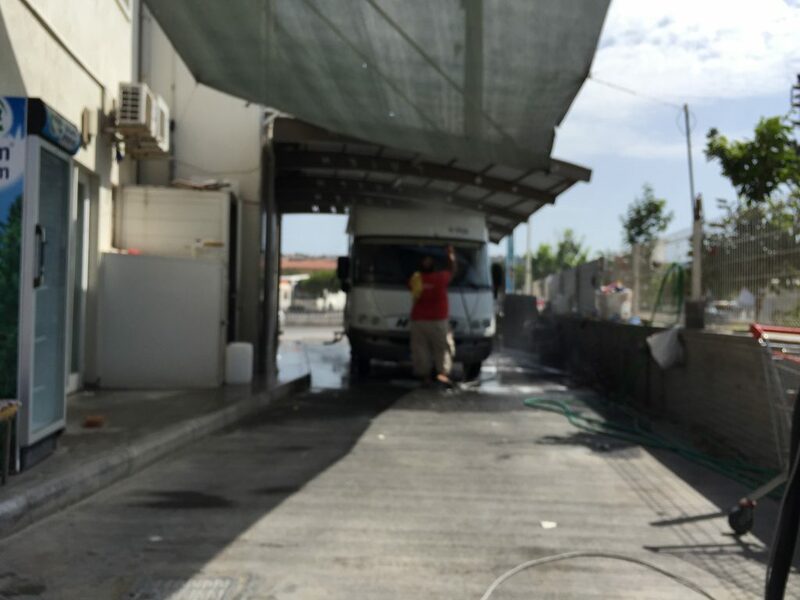 I normally wash it myself, but this car-wash was run by a Turkish family and for TL30 they did a much better job in 30 minutes than I would in an hour or so. Notice the photos a bit blurry, unfortunately the auto focus on my iPhone 6 has gone on the blink (not happy Jan). 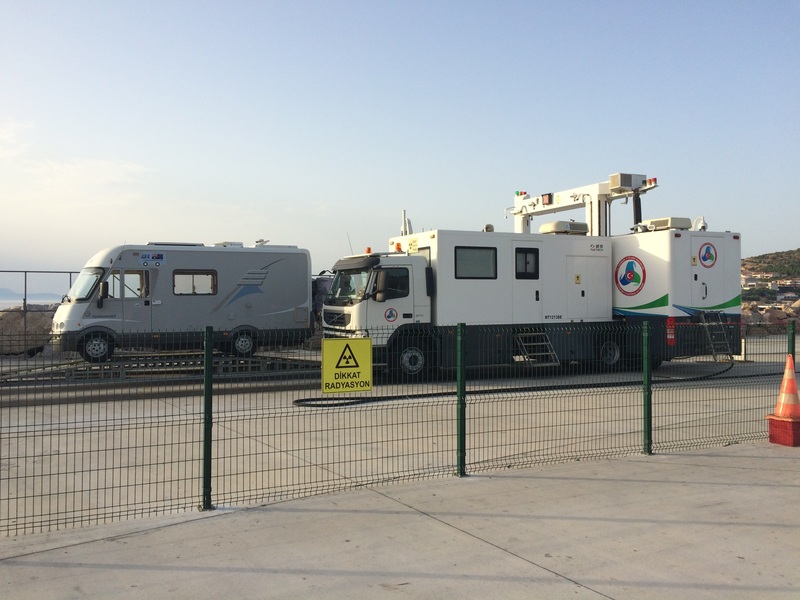 As it turns out we find out that all heavy vehicles exiting Turkey for Greece must be x-rayed and searched which we were. Only Cesme has this facility on this section of the coast. At one stage the scanner stops, sirens go off and lights flashed. We suddenly wish we had Julie Bishop’s mobile number, but then the customs officer jumps out and waves us away. Through all the checks, we sit quayside waiting for our ferry. We hear a loud blast from a horn and see a large ferry is approaching. A uniformed fellow suddenly appears and asks to climb aboard the Hymer to direct us onto the ferry. To our surprise it’s not to the big ferry but a much, much smaller one. Big enough for two cars or one Mercedes hatch and the Hymer if they only half close the loading ramp. The original aim of travelling Turkey was to visit Galipoli and ANZAC, then scurry back to the relative safety of Greece for an extended visit. 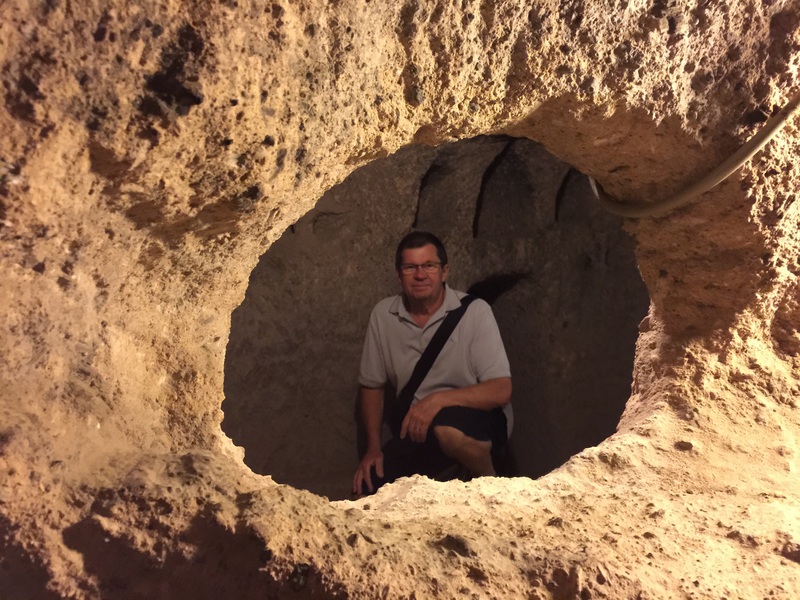 Then we thought if where going all that way we should visit Istanbul, then we read Cappadocia is a must visit and so it goes. Reading Adelaide couple, Jenny and Ewout’s blog added to our confidence. 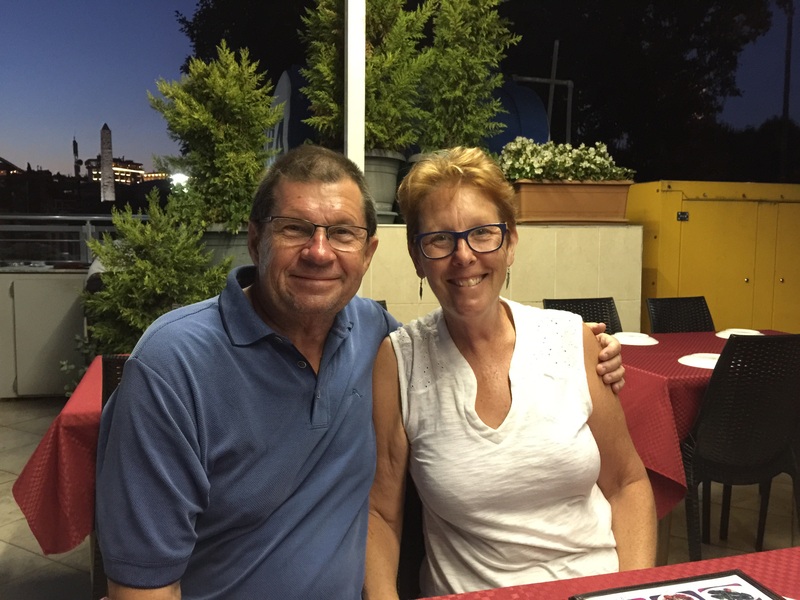 Our neighbours Colin and Gaye loved Turkey when they visited. So taking into considering the DFAT warning, we just decided to limit our eastward travels to Cappadocia and keep well clear of Syria. 1. The Turkish people are some of the most generous, helpful and patriotic we have met in our travels. One day an elderly lady walks us around this complex set of streets to find a laundromat. 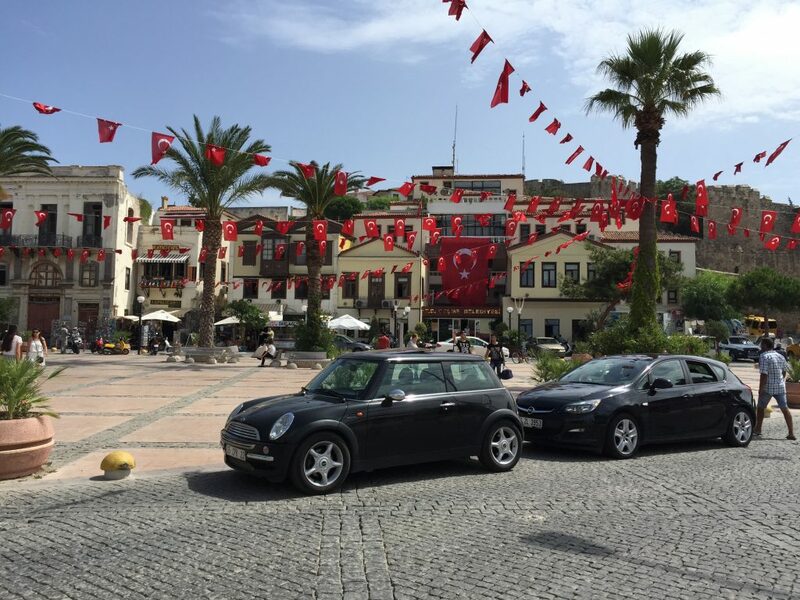 Turkish flags fly everywhere, we mean everywhere cars, houses and shops. 2. The Turkish motorway system is fabulous, big bridges, tunnels everywhere. It’s also relatively cheap, in 3 weeks of motoring covering thousand of kilometres we still have credit on a TL50 vignette. 3. Turkey has an amazing range and variation of natural landscape. 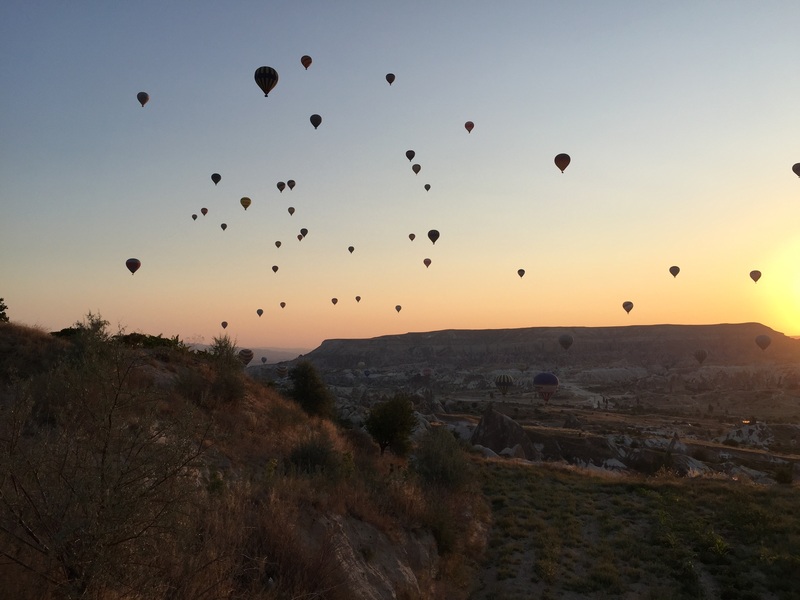 The Bosphorus, the Black Sea coastline, Cappadocia and the wilds of Anatolia. Then there’s the Aegean coast and the Bay of Mamaris. 4. You don’t have to worry about running out of fuel in Turkey, there is a service station over every hill. In fact there are probably two. Unlike many EU countries they also have service station attendants who clean your windscreen. 5. Turkish people appear very kind and tolerant of animal, particularly dogs and cats. 6. The Gallipoli ANZAC visit was a definite highlight. It’s a beautiful and strangely remote place. It is obviously closely cherished by the Turkish people, who visit the area in great numbers. 7. Istanbul is an amazing city full of delightful experiences. It’s a huge city with something like 14 million inhabitants and thousands of tourist, yet we travelled easily the public transport is good as well. 8. 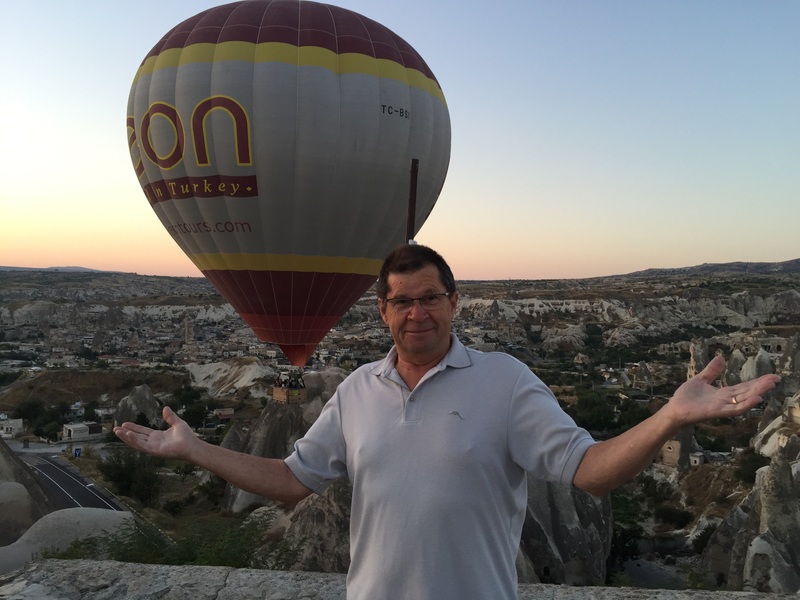 The balloon ride in Cappadocia a experience we will never forget. 1. We found when dealing with Turkish vendors they will try and rip you off, just a little. Whatever they think they can get away with. Bills are never added correctly, short changing is a real problem. 2. Some of the worst roads we have every driven on we’re in Turkey. The trucks are grossly overweight in our opinion and the roads reflect it. Deep ruts in the far right lane make it hazardous to maintain control. 3. The environment seems to rate fairly very lowly with the average Turk. There is rubbish everywhere. On most days we would see people just throwing rubbish our the windows as they drive. Cigarette butts, everyone in Turkey smokes, but the ash trays are all empty. 4. Diesel is expensive, petrol is even worse. Whilst most of the bigger cities had two grades of diesel, Euro or Premium there was only TL0.10 between them. In the country there’s nothing but Euro Desiel which is truck/tractor grade. Cheapest TL3.55 Euro, dearest TL4 Premium per litre. That’s over A$2 per litre. 5. There are stray dogs and cats almost everywhere, people obviously put food out but then seem to take no responsibility for were the animal is or what it does. Rabies is a problem in Turkey, so it probably highlighted the issue. 6. Alcohol is very expensive, next only to a London pub. Even from a liquor store it’s expensive by normal European standards. White wine is also difficult to find and expensive. 7. Like an episode of the Twilight Zone you wake to find yourself driving along surrounded by Renault 12TS’s and Peugeot 203’s. But your not back in 1985, it’s 2015 and you see the rust, chicken wire and 100mph tape holding them together. 8. Motorhomers like the company of other motorhomes especially when parking or staying overnight. 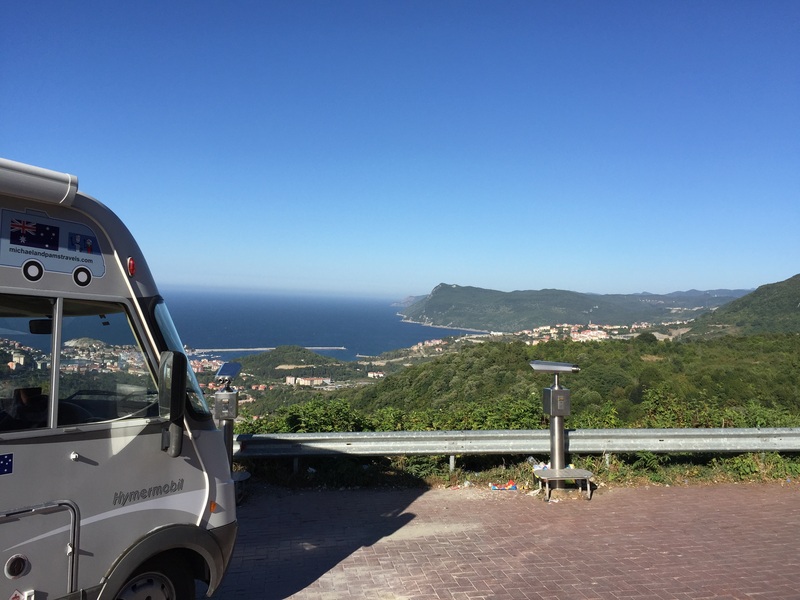 During our 19 days in Turkey we saw 3 other motorhomes all in the secure park in Istanbul and 2 more in a campsite in Cappadocia, so don’t expect a lot of company. 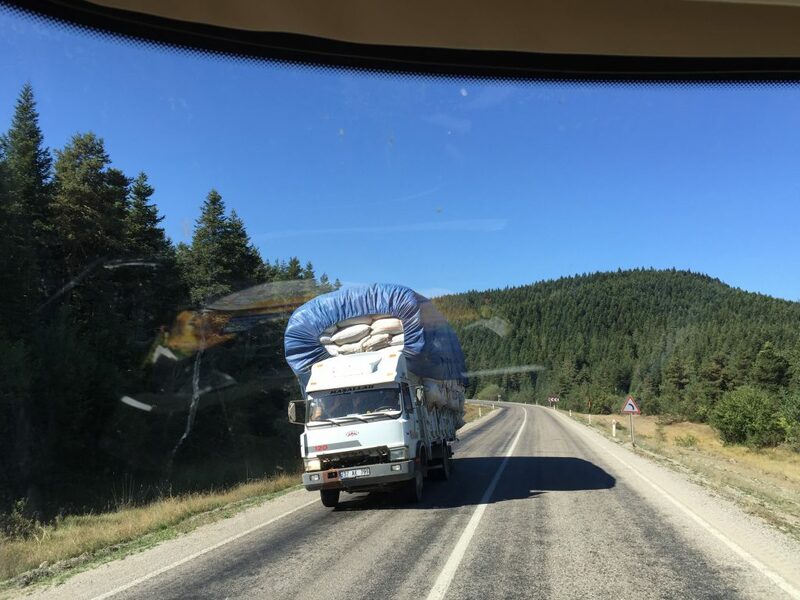 In summary we have not regretted the long and sometimes exciting drive around Turkey and have no hesitation recommending Turkey as a destination on the road less travelled. We really enjoyed our visit to Turkey. It was reading your blog that helped us gain the confidence to venture further than Istanbul.